Meet my latest dressage pad -- a custom Mattes (pronounced Mattus, not Matts, I'm told) pad that I ordered from SmartPak. Many of you may know that the dressage world is expanding its notion of "acceptable show colors" to include more than white, black, and navy. While dressage pads aren't discussed, I feel that riders in the avant-garde can start to experiment :-). 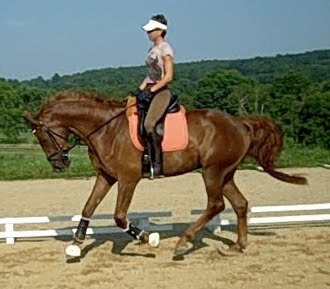 And Riley and I are ready to rock the dressage world with the our new orange-hued pad. I first saw my Mattes pad dream color, Terra cotta, while at Rolex. Terra is a really nice color -- not orange, not pumpkin, not rust, not peach, just a very pleasantly saturated rich apricot. I originally thought about getting aubergine and olive trim but when I used the Smartpak saddle pad customization application I could see aubergine would be a mistake. If they had purple as a colour, I would never get eldest away from this site. She's pushing to get a new pad in purple which would like nice with Oscar's dark buckskin colouring but his owner thinks purple is "too girly" for her boy! It does look nice, that's for sure. Also, I had no idea it was pronounced Mattus! Hey you! My daughter works in shipping at Smartpak- she says they were talking about you today! I should add- "in a good way!" With all due respect for your taste, personally I think anything apricot or orange on a chestnut is a big mistake. Rust possibly yes, but not apricot! I don't think it complements his coat at all. But yay for different saddlecloth colours in dressage events! White is not good for me, and as I have greys, white just makes them look dirty. Greys are better in any other colour. I disagree, but there's no countin' for taste. It's good to get different viewpoints out there. I personally am bored to death by the "forest green for chestnuts" tradition :-). Dare I tell you that Riley has an orange-lined haler? So what are YOUR favorite colors?? Love the pad! LOVE your blog. Have a huge request: Your trainer is a beautiful rider. Could you beg her to wear a hard hat and not just a visor? After this summer of accidents it seems almost perverse that dressage riders don't wear helmets. Especially the trainers who are role models to young riders who will emulate them - for better or worse. Here is a post from Courtney King just two days ago. Read to the end of her post and you will see how important it is to keep sending the message to the dressage world: Wear your helmets! Stacey, I think your new pad is just beautiful on Riley! You couldn't have chosen a better color! And I agree with you about SmartPak- they are a great company to deal with. 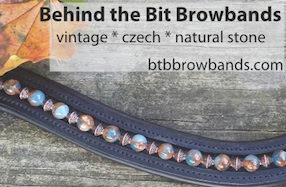 I have bought quite a few items from them and have been consistently pleased with them, and consistently impressed with their Customer Service staff. I just ordered a PRI pad in Smoke, for my dappled grey. It's not baby blue, not periwinkle, and not grey, but a perfect in-between that I think will be be snazzy. Can't wait for it to arrive! But my saddle pads tend to get pretty beat up. Would a $200 pad withstand the abuse? I hope so, but if not, YIKES! LOVE the color! When I first got my horses my friend lent me an extra pad she had - it was Pepto-Bismal pink. My boys were not impressed! For a chestnut, I also hate bottle green... erk so out dated! Tan, chocolate, rust, camel, taupe would be my colours of choice on a chestnut.